Isn't she pretty? I think so. 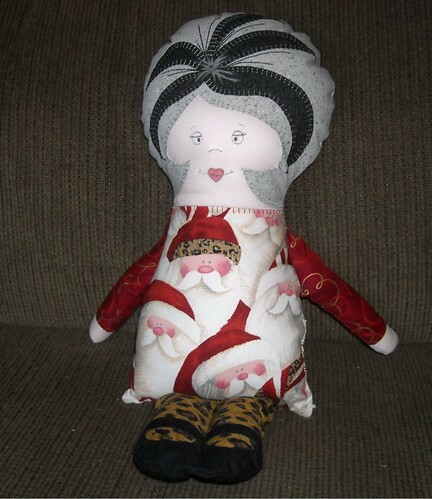 :) My little girl likes her a lot; we are calling her the "Christmas lady." And then the youngster of our group got the last present, which was from me. I had a hard time deciding what to make but here's what I ended up with. I sewed all the applique on ticker-tape style, after the 3 layers of the quilt were all layered. I wish I could have come up with something for that upper left corner but I guess it's ok the way it is. My 6-year-old is in a VERY LITERAL phase of life right now and he did not approve of my crooked and messy lines in this project. He said, "That's not a star" about my star and then told me the whole thing isn't very good. It's ok though, I told him it was supposed to be this way, but he thinks everything should be as neat and realistic as possible right now. It has the look of a string quilt block, only I didn't use any foundation paper or fabric for it. My advice on this kind of back is not to trim it the same size as the front until after the quilting is done! I wasn't thinking quite right on that one, should have left the back a little bigger. Oh yeah, I didn't point this out last night, but one of the tree fabrics is the feather fabric designed by Lauren--I'm glad she ended up with this and I hope she likes it as much as I do! 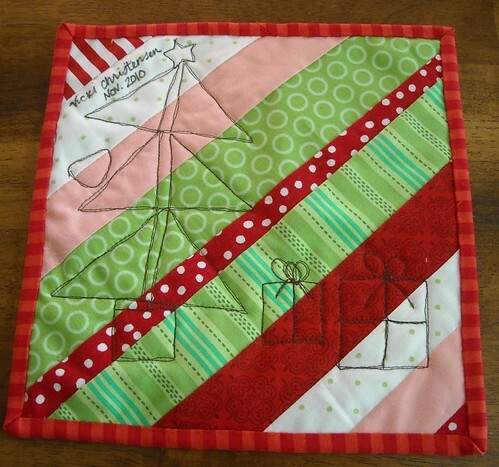 Your little Christmas quilt is super cute! I love it! Also, I just recently did invisible zippers for the first time and they are WAY easier than regular zips. The instructions that come with them in the package are all you really need to get them down. Your Christmas lady is funny and cute. I love both gifts. I really like the wonkiness and the ticker-tape style quilting is great. Vicki - the wee tree is just perfect! Love it ...and love that you left that quiet spot, it makes the focal point much clearer! 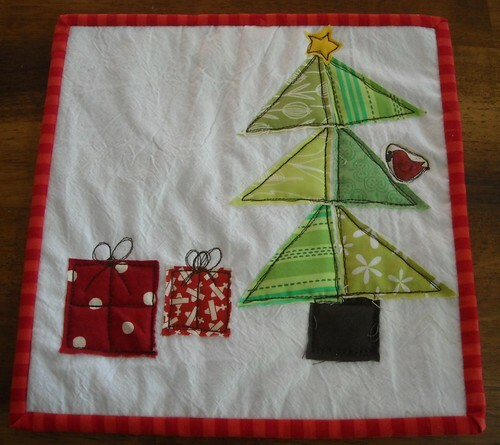 Love your little Christmas Quilt. That is adorable.